The word chocolate comes from xocoatl (Aztec language) which means a bitter drink. Aztecs and Maya in Mexico believe that the god of Agriculture has sent a chocolate that comes from heaven to them. Cortes then took him to Spain between the years 1502-1528, and by the Spaniards bitter drink was mixed with sugar, so it feels more comfortable. Brown then spread to France, Holland and England. In the year 1765 chocolate factory was established in Massachusetts, USA. In the development chocolate is not only a beverage but also become the preferred snack of children, adolescents, and adults. Besides it feels good, chocolate was nutritious to make age a person becomes longer. An epidemiological study has been conducted at Harvard University students who enrolled between the years 1916-1950. By using a food frequency questionnaire collected information about the habits of eating candy or chocolate at Harvard University students. By controlling the physical activity undertaken, smoking, and eating habits found that those who love to eat candy / chocolate age older than one year are not eating. Allegedly phenol antioxidants contained in chocolate is the reason why they can outlive. Phenol is also found in red wine that is well known as the drink is good for heart health. Brown has the ability to inhibit oxidation of LDL cholesterol (bad cholesterol) and improve immune function, which can prevent the risk of coronary heart disease and cancer. So far, there is the notion that chocolate causes of dental caries and may also be responsible for the problem of obesity. Undeniable that obesity is one risk factor for degenerative diseases. But a study at Harvard University shows that if you balance the consumption of chocolate candy with enough physical activity and eat a balanced diet, then the negative effects of chocolate candy need not worry. According to Mayan belief, chocolate is the food of the gods. Original flavor from the cocoa bean is actually a bitter alkaloid content, but after going through the engineering process to produce chocolate as the food liked by anyone. Cocoa beans contain 31% fat, carbohydrate 14% and 9% protein. Chocolate is rich in protein amino acid tryptophan, phenylalanine, and tyrosine. Although chocolate contains high fat, but relatively easy to rancidity because chocolate also contains polyphenols (6%), which functions as an antioxidant deterrent. Chocolate consumption in the United States contributes only 1% of total fat intake as stated by the National Food Consumption Survey (1987-1998). This amount is relatively small, especially when compared with the contribution of meat (30%), cereals (22%), and milk (20%). Fat in chocolate, often called cocoa butter, mostly composed of saturated fat (60%), especially stearic. But the brown fat is a vegetable fat which does not contain cholesterol. To keep pressing the saturated fat that is not too high, it is better to limit eating chocolate just one cigarette per day and consume mebatasi supplement or other food containing catechins such as apple and tea. In research involving human subjects, found that consumption of brown fat to produce total cholesterol and LDL cholesterol lower than the consumption of butter or beef fat. So even though both contain saturated fat but the effect was produced different cholesterol. High stearate content of the chocolate is suppose to be the reason why brown fat is not as bad as animal fat. Has long been known that stearic acid is a neutral fat that will not trigger blood cholesterol. Why? Stearate was slowly digested by our bodies and also absorbed less. 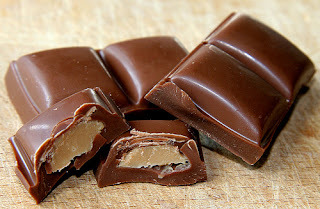 One third of fat contained in chocolate is oleic acid is an unsaturated fatty acid. Oleic acid is also predominantly found in olive oil. Epidemiological studies in Mediterranean populations who consume lots of olive oil is oleic acid oleic concluded positive effect on heart health. Often the question arises how much we may mengkonsusmi chocolate? There are no definitive recommendations for this nutrient, however, 2-3 times a week eating chocolate or drinking chocolate milk every day would still be acceptable. Principles of nutrition that is actually easy to eat all kinds of food are moderate. Nutritional problems generally arise when we eat too much or too little. Eating chocolate will not cause addiction, but for some delicious chocolate taste that may cause the desire to consume them again. This is called a chocolate craving. The impact of chocolate on behavior and mood (mood) is closely associated with chocolate craving. Brown could miss because of the aroma, texture, sweet-bitter and so on. It is also often associated with the content of phenylethylamine which is a substance similar amphetanine which can increase absorption of tryptophan into the brain which then in turn produce dopamine. Impact of dopamine is the show feeling happy and mood improvement. Phenylethylamine is also considered to have aphrodisiac properties that gave rise to a feeling like someone in love (heart flowers). It is said that King Montezuma in ancient times was always drunk chocolate before rotating harem-harem different every night. Catechins are powerful antioxidants contained in chocolate. One of the functions of antioxidants is to prevent premature aging that can occur due to pollution or radiation. Catechins are also found in tea even though the amount is not high on chocolate. Parents are often ancient practice with a water wash of tea because it can make facial skin glowing and youthful. If they know that chocolate contains catechins is higher than the tea, maybe they'll suggest a shower scrub with brown. Chocolate also contains theobromine and caffeine. Both substances have been known to give effect to those who consume them awake. Therefore when we are dozing off at the airport or waiting for long queues, eating chocolate potent enough to make us excited again. Fairly wide range of chocolate products. For example, there is a milk chocolate is sweet chocolate dough, cocoa butter, sugar and milk. In addition there is also a bitter chocolate which is a natural brown and contains 43% cocoa solids. This type of chocolate products can be found in some chocolate bars. 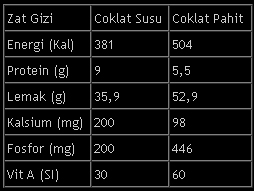 Nutritional content of chocolate can be seen in the table. There is no evidence that chocolate causes acne. Brown also can not be said to be a major cause of dental plaque due to the emergence of dental plaque can also occur in people who consume regular meals daily. It's just chocolate should really pay attention, especially for vulnerable people who suffer from kidney stones. 100 g chocolate consumption will increase the excretion of calcium oxalate and tripled. Therefore healthy tips that can be recommended is to drink plenty of water after eating chocolate.